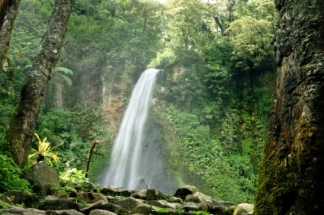 Cibodas botanical garden, a paradise in South East Asia with waterfalls and valleys. Located on the slope of the twin volcanoes Mount Gede and Mount Pangrango, also has an function as a gate to peoples who wants to climb this mountains. This place attract more than 400,000 visitors a year. 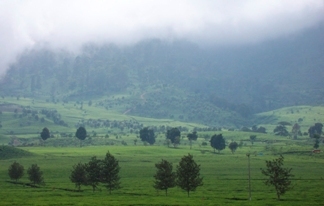 Located on the slope of the twin volcanoes Mount Gede and Mount Pangrango, also has an function as a gate to peoples who wants to climb this mountains. This place attract more than 400,000 visitors a year. Because of the location on 1300-1425 meters above sea water, this garden has always a cool temperature average 18 degree Celsius. This enchanted garden has an area of 80 hectares (200 acres) with rugged terrain, waterfalls and valleys. The Dutch botanist and curator Johannes Elias Teysmann has founded this place in 1862, and the main purposed was studying mountain flora and founa. In this day the garden use by many scientist to do their research in tropical rain forest. This place is also known as one of the first class tropical research station in the world. Many people call this place as a part of paradise on earth because of their beauty. It is really beyond description with the spectacular meadows, deep groves and hundreds of trees with different types and ages. Today you can enjoy the collection of 5800 living specimens from 1200 various species. Also 400 kinds of cactus or 350 varieties of orchid. So if you’re on travel from Jakarta to Bandung or otherwise, and you use the route through Puncak, don’t forget to stop in Cianjur. Cianjur is also famous with their local specialties in confectionery of fruit (manisan Cianjur) and their snacks Bika Ambon, very famous for the local people.